For our second to last movie in #undeadOctober, we decided to watch one of +Sarah Weitzel's favorites, Zombieland. It is a road trip zombie movie, which is actually pretty rare category of zombie movie. The heroes, after a rough start, decide to head to an amusement park. On their way, they have a lot of fun and develop new friendships that they didn't think they would get. The zombies in Zombieland are created when mad cow disease progresses and eventually turns everyone into zombies. The zombies are fairly standard, but then again, they are not the main focus of the movie either. The zombies are resistant to damage and are able to move very quickly. The best method of elimination is by headshots and there really isn't anything else special about them. The movie meets all of my criteria for a good zombie movie. Lots of really good gore and I really like the comedic take on the zombie deaths in this one. They even go as far as talk about "zombie kills of the week." The story even has a little love story and they do a great job with character development. I think it is great to see the characters grow and develop as they face their inner demons. As for the rating I would give this one, I give it a 4/5. Why only a 4/5 and not a 5/5? I mean, it did meet all of my criteria. The problem I have, which is big enough for me to remove a whole point, is the Bill Murray scene. I feel like all it did was add to the screen time and tried to big another big star into the movie. This is nothing against Bill Murray because he is just awesome. I just think that it was added fluff and didn't add anything to the story. I mean they even talk about that they decide to rest just because they are having fun. I would have rather have it be important to the story or make some big change in the characters. I might be being a little harsh, but I just hate it when movies are created to target audiences to such a degree that they sacrifice good story telling. Even with the added scenes, it is still a great movie. I just think it could have been so much more if they could have just switched out those scenes with something more meaningful to the overall plot. Alright, I will quit complaining and get to the zombie summary. Well that about wraps it up for this one. 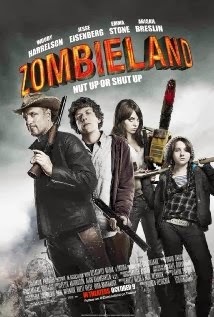 If you have not see Zombieland yet then I recommend that you go check it out. And check back tomorrow for our final zombie movie of the month!